Long term fans of the series will be delighted to hear that David Suchet returns to our screens this Christmas as Agatha Christies famous Belgian Detective. 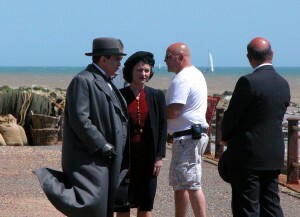 The latest episode, “The Clocks”, will be shown on ITV over the festive period. When Secretary Shelia Webb (Jaime Winstone) runs out of a house into the arms of Lieutenant Colin Race (Tom Burke,) Hercule Poirot is called to Dover to investigate the death of a man who was found surrounded by four clocks, all stopped at the same time. Shelia becomes the prime murder suspect, despite assurances that she does not even know the victim. While the evidence mounts, Poirot must solve the mystery before another innocent victim is found brutally murdered. 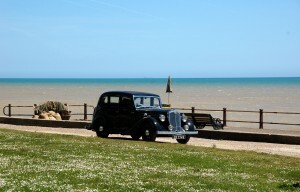 The production visited a number of locations in and round the historical town of Dover, including Dover Castle, Waterloo Crescent and the village of St Margaret’s Bay. The bay boasts the famous Art Deco house ‘White Cliffs’, who’s previous owners include Noel Coward (playwright) and Ian Fleming (author of the James Bond novels) and proved to be the ideal setting for this adaptation. Dover is home to several renowned locations including the port, connecting the UK with the European mainland, Dover Castle which was first built in 1160 and largely remains in the same condition as it was when first constructed and the infamous White Cliffs of Dover. Dover has previously been seen on screen in The Tunnel: Sabotage(2016), The Other Boleyn Girl (2008) and Missing (2009). 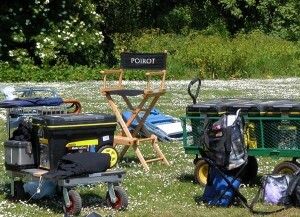 Not the only Poirot episode to be filmed in Kent, viewers may remember Hercule Poirot’s Christmas, which was filmed in the village of Chilham in 1995. The village was turned into a winter wonderland as Poirot investigates the murder of multi millionaire Simeon.Celebrating 23 years in his most famous role, David Suchet has signed a deal to film the remaining five Poirot novels, Labours of Hercules, Dead Man’s Folly, The Big Four, Elephants Can Remember and Curtain, which is Poirot’s last case. 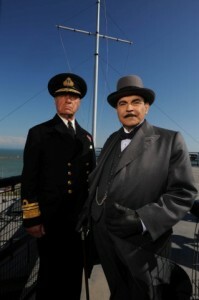 Poirot – The Clocks was shown on ITV1 Boxing Day 2009 at 21:00 and is now available to buy on DVD. This entry was posted in Filmed in Kent and tagged David Suchet, Dover, Dover Castle, Jaime Winstone, Poirot The Clocks film locations, St Margaret’s Bay, TV Drama, Waterloo Crescent. Bookmark the permalink.